Upon fleeing Europe in the late 60s my Grandparents were faced with the option of moving to Canada or Australia. They were told they’d be living in the forest if they chose Canada, my Grandpa does not like forests. This body of work examines stories and memorabilia from a personal past and applies them to my own modern experience. Embracing a humorous undertone the work looks at a personal history in a private and public context. Allowing for participation, I piece together an understanding of circumstances surrounding family history. The work aims to evoke the memory of a past era by playing out an act of visual remembering. Catalogue essay by Sera Waters - Adelaide based artist and arts writer. Two generations ago Jenna Pippett’s Grandparents packed their Czech life into a suitcase. Amongst the underwear, toothbrushes, brooches and falsified personal documents – all masquerading as a brief trip away - hid an escape route to anywhere. Practical and distrustful of a future in freezing Canadian forests, when given a choice they said “Australia” and arrived, suitcase in hand, to beachfront sunshine and welcoming accommodation. Though their baggage kept up the façade of being minimal, this was another ruse, for that suitcase (with previous and future lives contained within) has proven in Pippett’s hands to have Poppins depths and proportions. Out of it she pulls old-time memories, plastic fruits, family resemblances, decorative steins, edge-worn photographs, communist era happenings and much much more. For Pippett, and similarly many Australian families with an inkling of refugee or sneaky migrant history, these trickster suitcases remain bursting with innumerable pasts, multiplying presents and potential futures….even futures in Canada. Pippett time travels into her family past with a humorous glint of the eye. These days you will find her amidst her family’s photographs and films; drawing attention to inherited traits spanning generations, or angling her stance to echo an ancestor photographically frozen before she was even born. 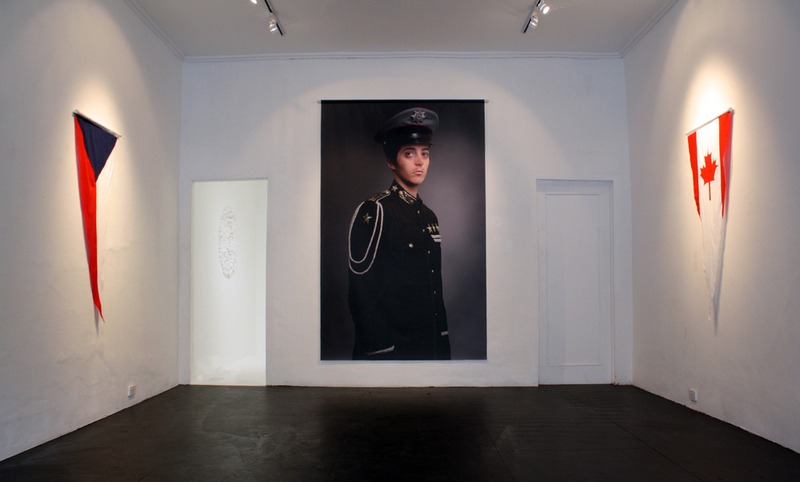 Here, in this exhibition, she poses as a boy-man in military uniform (not a unitard), larger than life with the feigned omnipresence of a communist leader surveying household and national conduct. Czech and Canadian pennant flags hang alongside as if the family home is playing it safe by representing potential and past allegiances. And Cher, best remembered straddling a cannon upon a US navy ship, large hair and leather jacket not near ample enough to distract from the miniscule black unitard, unexpectedly comes up in a recorded conversation between Pippett and her Babi. Trying to remember Cher (and just how to pronounce her name) and learning to count in Czech become their way of time travelling between generations and countries, equipped with blurred Eurovision memories.